From the end of last February to the beginning of March, a joint exhibition by Ushio Shinohara and Chu Enoki took place in the Museum of Modern Art, Saitama. One of these artists got the name of a fighter of anti-art in the legend "Yomiuri Independent" exhibition and the other is a super artist who astonished the world from Kobe with unconventional "ZERO" art. The exhibition was groundbreaking without any doubt.The exhibition was not organized by the museum. The organizer was an NPO who used a public service to provide citizens an opportunity for exhibition. So, the exhibition was sited in the public gallery in the basement floor that anyone can rent if certain conditions are met. This service which is natural as a museum run by taxes is not accepted well by the art world where only authorized art is admitted. They regard these "private exhibitions" by ordinary people enabled by such services as inferior to a "public exhibition" held by the museum where people are given lessons sitting on their knees. It is true that we see many private exhibitions in public galleries falling short of the "standard" in our country where certain ideas toward art are predominant compared to the West. However, this situation itself is what the art authority and museums asked for, since it is the result of the public art education, including the one given by museums. So, this exhibition had great meaning though it was only for six days, due to the way that it was sited in a public gallery instead of a museum gallery, organized independently by an NPO, and above all, had comparable quality to one curated by a curator who was educated professionally and authorized to plan and execute exhibitions. We can say that this is an example of the citizens being mature over art outside of the museum. It may be pioneering a future in which citizens provide distinguished plans to diversify, revitalize, and innovate the museums from the "outside". The exhibition which ran for a very short period had full-blown works which could last for a duration of weeks or months. The main work of Enoki's big solo show "Unleashing the Museum" in the Hyogo Prefectural Museum of Art (which did not travel to the Tokyo metropolitan area) was recreated in full scale, the compilation of the Boxing Paintings which Shinohara had energetically created recently in various locations, and rather small but fierce pieces from a bike sculpture series also by Shinohara were exhibited. Beside that, considerable document films were shown and performances by the artists were held during the exhibition. 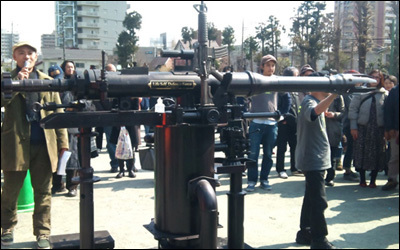 In the performance on March 3rd, many people gathered to the Tokiwa Elementary School playground next to the museum to see the Boxing Paintings by Shinohara and salute using a big cannon sculpture from the exhibition by Enoki (the location was fine but the park where the museum is located could also have been a good place for the performance). 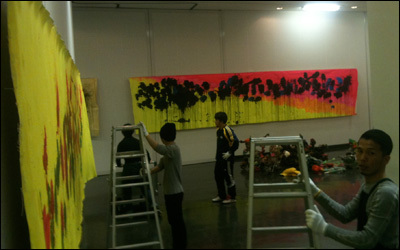 Thus, the event connected the museum with external, delighted children and satisfied adults, and became a breakthrough project with very high "standard" art works. The idea of the project, connecting the two artists, was also meaningful. Shinohara cut his hair in the Mohican style from his Neo Dada period, and Enoki shaved one half of his hair (the legend "Hangari" style) of the 70's to use their body as well as paintings and sculptures for their expression. Both of them anticipated this so-called body art and executed it in the earliest days. This concept was once implemented in the "Gyu and Chu" exhibition in the Toyota Municipal Museum of Art, Aichi Prefecture in 2007 (this excellent show also did not travel to the Tokyo metropolitan area). Coupled with the playful sounds of the artists' nicknames and the contrast of the hair styles of the two, the exhibition reexamined the 60's avant-garde art from a new perspective. The C.A.J exhibition, which follows this precedent, was enthusiastic to further discover new possibilities of this "unit". In contrast to the vigorous efforts of the citizens, I had the impression that the museum could not support them effectively. I could come to the performance because I was given a chance to write about this project and informed of this a day earlier. When I tweeted about the project right after the performance, there was an astonishing number of replies such as "I didn't know that such an event was going on in my neighborhood", "I am very sorry to miss it, I only knew about the event because of this tweet after it finished", and "Why was it not featured on the museum web site?" Receiving these replies, I checked the museum web site and found out that there were no information of this exhibition. What little announcement they had was just the title of the exhibition "Gyu and Chu" (without artists' names) in the annual schedule of the public gallery. Also, the exhibition was closed on 13:00 on the final day, even though it was Sunday, perhaps to secure time to take the exhibits down. With such an attitude, the show would not be able to spread to the outer world no matter how good it was.I do understand that there is a general rule that an opportunity given by a public service must be equal to everyone. However, a show is a show to the visitors. If the curators were aware of the special meaning of this exhibition, why could they not cooperate with them more positively in many ways? This morning, I heard a news about an incident shortly after the 3.11 earthquake on the radio. It said that thirty cup noodles were sent to a shelter where fifty hungry citizens were evacuated, and that the cup noodles were not offered because there was not enough for all. After the disaster, we heard many negative stories of bureaucratic work, including the ostrich policy in the nuclear accident response. Though the scale is incomparable, I could see a similar nature in the work of the museum. Anyway, information is now spread wide and instantly more than ever through Twitter, Facebook, mobile phones, and smart phones today. May be we are living in an age where civilians can "use the museum hand over hand" with their initiatives to overcome the present state of art and go forward into future. I look forward to the continuing development of the C.A.J. projects.